*CD version comes in a 4 panel mini-LP style gatefold package with spot UV printing* ‘Dances In Dreams Of The Known Unkown’ is the new album from Swedish group The Skull Defekts, with the legendary Daniel Higgs (Lungfish) joining Joachim Nordwall and Daniel Fagerstroem on vocal duties and acting as the group’s spiritual ringleader. The Defekts have long acted as the backbone of the Swedish experimental underground, but since their 2011 breakthrough ‘Peer Amid’, the group has emerged at the vanguard of a new wave of radical Scandinavian rock music alongside Iceage and the Posh Isolation label. 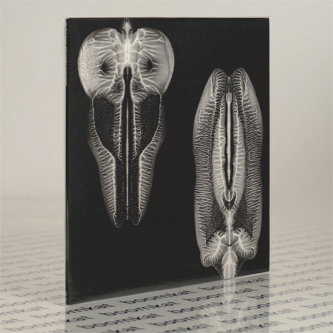 From the opening patter of ‘Pattern Of Thoughts’ to the propulsive chants of ‘Cyborganization’, ‘Dances In Dreams Of The Known Unknown’ feeds on the tension between lean and bright song production and the hefty, sometimes surreal sounds produced by Nordwall and Fagerstroem’s guitars. Daniel Higgs’ spontaneous, metaphoric poetry is as perplexing as ever, but it is delivered with a clarity not heard since his days fronting Lungfish. Album centrepiece ‘The Known Unknown’ is centred around a driving riff, with Nordwall turning the song’s title into a mantra as intense as it is transcendent. Throughout, the group anchors their riffs with exotic sustained chords, adding a distinctly Carnatic flavour. The Skull Defekts are one of the centrepieces of Sweden’s experimental rock scene and toured the world in support of their last album ‘Peer Amid’. Joachim Nordwall’s long history in the European experimental music community serves to reinforce the group’s place as one of the most forwardthinking rock bands working in the continent today. In addition to running iDEAL Recordings since 1998, Nordwall has released collaborative recordings with Mika Vanio of Pan Sonic, Kevin Drumm and Mats Gustafsson, whose FIRE! Orchestra he recently joined. Daniel Higgs is the lyricist and frontman of Lungfish and also has a very extensive catalogue of solo material. In addition to his music Daniel is a highly respected visual artist.